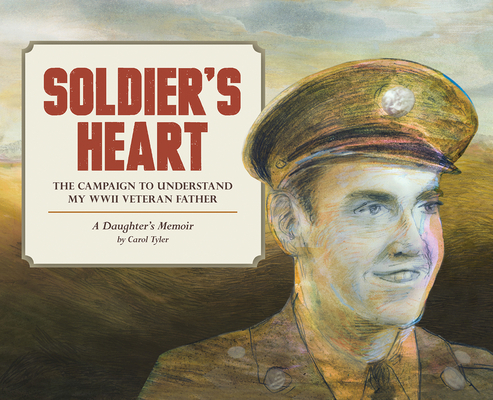 Soldier's Heart is a sophisticated graphic masterpiece about the damaging effects of war on soldiers and the toll it can take on families. Many soldiers come back from war and never talk about it -- especially those from the Greatest Generation. Thus was the case with S/Sgt. Charles W. Tyler, who late in life began to open up to his daughter Carol. By looking at him, you would never know that he was wounded in combat, but as she states at the beginning: "Not all scars are visible." The narrative unfolds over 364 pages of masterfully crafted drawings. Stunning ink and color washes weave through the decades: Tyler examines the past in sepia, confronts reality in stark black & white and uses rich color to convey the moods and fragility of the present. She overlays her father's memories with her own, while struggling to understand her troubled life: a failed marriage, a teenage daughter on the edge, and an elderly father and mother. Literate, emotionally engaging and historically accurate, Soldier's Heart is a magnificent achievement. Soldier's Heart collects Tyler's hardcover series You'll Never Know, serialized between 2009 and 2012, and contains nearly thirty new pages of additional content.